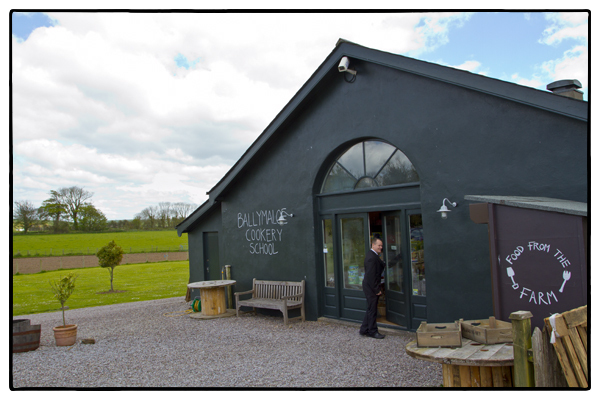 The Ballymaloe Cookery School. Photo by David Lansing. So I was trying to explain how Ballymaloe is a hotel. And a restaurant. And a cooking school. Ivan and Myrtle Allen started the whole thing back in 1948 (you can still catch Myrtle having a cup of tea by the fireplace in the parlor most mornings; Ivan passed away in 1998). Anyway, if I start explaining who all of the Allens are (even I can’t keep them straight) and who does what around here, we’ll all end up confused. So I’ll just go right to Darina Allen who learned a bit about Irish farmhouse cooking from her mother-in-law, Myrtle, and then opened the Ballymaloe Cookery School with her husband Tim 30 years ago. It’s in no way an exaggeration to say that Darina Allen is now Ireland’s best-known chef. In addition to running the Ballymaloe Cookery School, she’s also a newspaper columnist, cookbook author, and television show celebrity. Oh, and she started the whole Farmers Markets in Ireland thing. Here’s Darina on her cooking school: “We started the school because I was a chef and my husband, Tim, was a farmer and we wanted to run something from home. This connection between farming and cooking is vital. Unlike any other cookery school in the world, we are located in the middle of a 100-acre organic farm, of which ten acres are devoted to organic market gardens, orchards, and greenhouses. This means that our students can learn to cook using the finest and freshest of ingredients. It also means we have a great variety of ingredients—for instance, we grow over 40 different types of tomato alone! Which perhaps explains why the web site for the Ballymaloe Cookery School is cookingisfun.ie. That’s Rachel (cookbook author and Darina’s daughter-in-law), Myrtle (the grand dame of Ballymaloe), and Darina (founder of the Ballymaloe Cookery School).